Comparison of one techniques of patient-controlled analgesia with intramuscular meperidine. Postcesarean delivery epidural patient-controlled analgesia. TABLE 1 Study epochs Epidural Major analgesic Study period June 1-May 31 analgesia IV PCA events Pre-MASTER 1999-2000 357 1447 1804 trial 2000-2001 341 1450 1791 2001-2002 332 1558 1890 Total 1999-2002 1030 4455 5485 12-monthly mean 343 1485 1828 1999-2002 Post-MASTER 2002-2003 221 1767 1988 trial 2003-2004 196 1766 1962 2004-2005 175 1987 2162 Total 2002-2005 592 5520 6112 12-monthly mean 197 1840 2037 1999-2002 IV PCA=intravenous patient-controlled analgesia. The intravenous form of paracetamol is a suitable drug in the treatment of mild and moderate postoperative pain and can be administrated intermittently or by patient-controlled analgesia (PCA) pump. This Red Dotaward winning product is used in hospitals only and innovatively facilitates the handling of patient-controlled analgesia in post-operative pain. Ozalevli M, Unlugence OM Comparison of morphine and tramadol by patient-controlled analgesia for postoperative analgesia after tonsillectomy in children. Background infusion is not beneficial during labor patient-controlled analgesia with 0. Preoperative psychologic and demographic predictors of pain perception and tramadol consumption using intravenous patient-controlled analgesia. 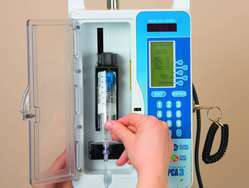 Traditional pain management for TKRs include a computerized pump called the patient-controlled analgesia (PCA) with or without an epidural which can lead to nausea, vomiting, urinary retention, low blood pressure, constipation and itching. It is being evaluated for the treatment of moderate to severe post-operative pain in the hospital setting and could be used in lieu of intravenous patient-controlled analgesia (IV PCA). They demonstrated that the addition of preprocedural oral oxycodone to morphine patient-controlled analgesia did not offer any analgesic advantage to patients undergoing uterine artery embolization. It covers delivery, assessment and monitoring, the pharmacology of opioids and local anesthetics, nonopioids and adjuvant analgesic agents, systemic routes of opioid administration, patient-controlled analgesia, epidural and intrathecal analgesia, other regional and local analgesia, nonpharmacological therapies, acute neuropathic and persistent postacute pain and its treatment, nonsurgical acute pain, more complex patients like older and opioid-tolerant patients, and opioid analgesia after discharge from a hospital (a new chapter).